AJAX event calendar with drag and drop support. Toolbar for fast switching between day, week, and month views. Visual Studio 2012 solution with the tutorial source code. Microsoft SQL Server LocalDB database. Includes C# and VB projects. This tutorial shows how to integrate day, week and month views with the navigator (date picker) and view-switching toolbar. For an introductory tutorial on event calendar project setup and basic event handling please see Event Calendar for ASP.NET MVC 4 Razor (C#, VB.NET, SQL Server) tutorial. Licensed for testing and evaluation purposes. You can use the source code of the tutorial if you are a licensed user of DayPilot Pro for ASP.NET MVC. Buy a license. The day view is created using DayPilot Calendar control switched to Day mode (ViewType = ViewType.Day). The week view is created using DayPilot Calendar control switched to Day mode (ViewType = ViewType.Week). The month view is created using DayPilot Month control. The date navigation is handled by DayPilot Navigator control. All controls use the default (built-in) theme. You can also create your own CSS theme using the online WYSIWYG theme designer and apply it using Theme property of the config. The toolbar is created using DayPilot.Switcher class that connects the three views (day, week, and month) with the navigator and the toolbar buttons. Every toolbar button is linked to a specific view. Clicking the button activates the view. After changing the view, the switched invokes OnCommand event with "navigate" command. This way you can refresh the view. The navigator selectMode (day/week/month) is updated depending on the active view. The server-side OnCommand handler updates the view. This tutorial shows how to create Gantt chart in ASP.NET MVC using DayPilot Scheduler. Includes a sample Visual Studio 2010 project (C#, VB.NET, SQL Server, Razor). A quick start web project that shows how to create an interactive event calendar in ASP.NET MVC 5. 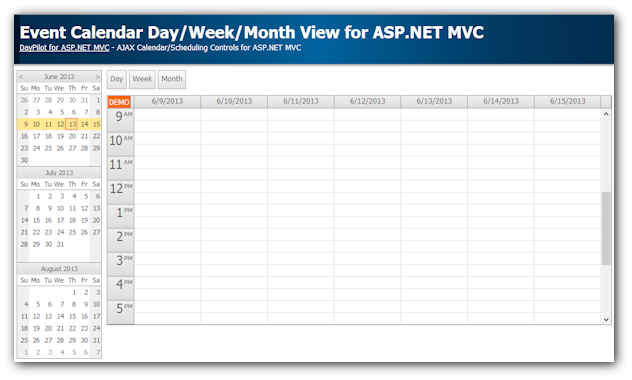 This tutorial shows how to use the DayPilot Calendar with MVC 4 and Razor engine. Includes C# and VB.NET source code and a sample SQL Server database. This tutorial shows how to use the DayPilot Scheduler with MVC 4 and Razor engine. Includes C# and VB.NET source code and a sample SQL Server database. ASP.NET MVC 5 application for hotel room booking. It keeps track of the rooms and reservations, showing the available slots, reservation and payment status. Drag and drop reservation scheduling is supported. How to create an AJAX monthly event calendar using DayPilot Lite for ASP.NET MVC (open-source). 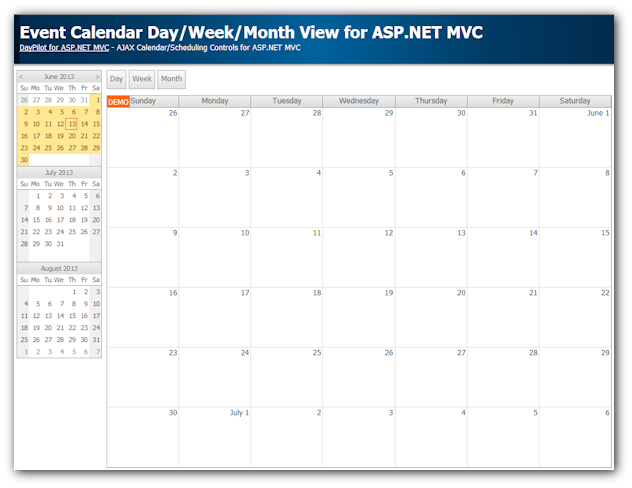 A quick start (boilerplate) Visual Studio 2015 project for DayPilot Pro Calendar (ASP.NET MVC 4). 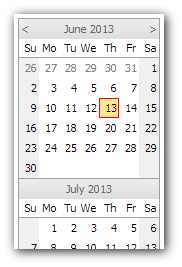 This tutorial shows how to display full day/week/month event calendar with a toolbar for switching the view. Includes C# and VB.NET source code and a sample SQL Server database. Angular project that displays an event calendar component with day, week and months views that share the same data and can be easily switched. A date picker component is used to switch the current date and highlight busy days.